If you're buying (or selling) modern inscribed books, beware. There seems to be a forger at work. Ian has the scoop, via dealers Peter Stern and Jeffrey Marks. Well if I'd know this was going to be Google Books Settlement week I would have just planned one big post and had done with it, but since the drip-drip continues ... today's big news is that the Justice Department has opened an antitrust investigation into the settlement deal. "The inquiry does not necessarily mean that the department will oppose the settlement, which is subject to a court review. But it suggests that some of the concerns raised by critics, who say the settlement would unfairly give Google an exclusive license to profit from millions of books, have resonated with the Justice Department." BAH! These are the stories that really irk me. The BBC is reporting that a British appeals court has halved the jail sentence of Farhad Hakimzadeh, the Iranian-British millionaire who mutilated and stole books from the British Library. Hakimzadeh pleaded guilty to the crimes and received a two-year prison term in January. Today's ruling "means that Hakimzadeh, having served 104 days, will be released in 78 days time." A British Library spokesman said the institution is disappointed in the ruling, and that they continue to pursue legal options (a civil suit is still in process). Look, there's no reason this sentence should have been reduced. This guy admitted what he did. He accepted a plea deal. He should do the time. Utterly ridiculous. An Andrew Jackson letter stolen from the New York State Library has been recovered after a University of Tennessee historian noticed it on the auction site Profiles in History, according to media reports. The letter, written by Jackson to Samuel Swartout on 24 March 1824, was being offered for sale at $35,000. Timothy Coens saw the letter and informed New York authorities, who were able to arrange for its return. Investigators discovered the letter was missing from the State Library during the investigation into the thefts of Daniel Lorello, a former State Archives employee now serving a prison sentence. WTEN's report says that the theft of this letter has now been "tied" to Lorello's spree as well. Judge Denny Chin has granted a four-month extension to the Google Books settlement deadline, Publisher's Weekly reports. The comment/objection/opt-out period will now continue through early September. Those seeking an extension praised the move; an Authors Guild spokesman said they had continued to hope for just a two-month extension. More from Wired. Tim's made some super-cool changes to the way LT displays the Legacy Library statistics - see his blog post for all the gory details. One of the nifty new features is a top shared list for all the Legacies (it took me a little while to guess which book is the most-shared). We've also started creating slice-and-dice options so you can categorize the Legacies (Signers of the Declaration of Independence, scientists, actors - you can help out with this, here). There's an LT discussion thread for bugs and comments and things here, too, so please feel free to chime in. Sorry I didn't hear about this before this morning, or I would have gone and taken pictures! - The judge charged with overseeing (and potentially improving) the settlement has rejected the Internet Archive's attempt to intervene in the suit. Publisher's Weekly reports: "The IA had said it does not want to file an amicus brief, also known as a friend of the court brief, as other parties said they intend to do, and it believes 'there are no existing parties in the case that could adequately represent the Archive’s interests, or the interest of other Internet content providers.' Now that the court has denied the IA's intervention request, it is looking at a number of different alternatives, including filing an amicus brief. The IA wants to remove orphan works from the settlement and limited the settlement to rightsholders who have filed a claim." - A group of authors and the estates of others (including John Steinbeck and Arlo Guthrie) are asking the judge to delay the deadline for opt-out by four months. "The group of authors seeking the delay has not come out against the settlement. The members argue that, given the complexity of the agreement and its long-range implications, the May 5 deadline should be extended by four months to allow authors to make informed decisions about how to proceed." Google, the Author’s Guild and the Association of American Publishers have also asked for an extension of the opt-out period, but they only want an additional two months. - The World Digital Library went live this week, with 1170 items from 25 institutions. I spent some time last night browsing the site, and like it quite well. Among the items I found there was Richard Mather's copy of the Bay Psalm Book (via the John Carter Brown Library). I've added the link to the scan to the book's LT record. - From the University of Barcelona, a revamped online database of printers' devices, containing 2182 images from 1372 printers. Great for browsing! - News broke this week of a fun Ben Franklin find: Alan Houston has discovered in the BL a cache of long-lost copies of Franklin letters from the mid-1750s, concerning Braddock's expedition into Pennsylvania, among other things. The letters, copied by Thomas Birch, will be published in April's WMQ. Coverage also from the Washington Post. I know exactly the feeling Houston's talking about - it's pretty amazing. - In the WSJ, Stephen Marche writes about missing literary works (like Shakespeare's 'Cardenio') and why they tantalize us. - OCLC's making another power-grab. Tim has the details, and the follow-up, including links to some really good Library Journal pieces on the subject. Some really questionable stuff going on over there, I have to say. - Brian Cassidy's trying out a new experiment on Twitter: cheepreads. Check it out. - Some movement in the Rolland Comstock case this week: lawyers for Comstock's ex-wife Roberta have filed a motion to preserve a collection of photographs which apparently were an issue between the Comstocks prior to Mr. Comstock's murder in 2007. The motion, part of a wrongful-death suit against Roberta Comstock filed by her daughter Faith Stocker, contends that the photos "constitute important potential evidence in this matter and should not be destroyed as they potentially provide evidence of possible alternative motives relating to the death of Rolland Comstock." The contents of these photographs is unknown. - The Internet Archive has jumped into the Google Books settlement, telling the judge charged with approving the settlement that the deal would compromise IA's ability to compete with Google. Full letter here. - Via LibraryJuice, a revealing Chronicle story about the key question these days of what happens to digital archives when they change owners. Just another scary element of our brave new world, I fear. - At McSweeney's, Robert Lanham offers up an "Internet-Age Writing Syllabus and Course Overview." Scary, but hilarious. - Steven Johnson has an essay extolling the virtues of e-books in the WSJ; the New Yorker's Thessaly La Force says not so fast. Of course I don't buy the "e-books won't work because they're not pretty" argument either ... if that becomes our only line of defense, we lose. - Amazon has strengthened its requirements for selling "collectible" books. But it looks like their commission fees for high-end items may be problematic. - The Simpson sale in New Zealand was a big success, netting some $470,000 (NZ). - Mary's posted some updates at the Adams Papers Catalog blog this week - lots of proofreading going on up there these days! - At Reading Archives, Richard Cox reviews Anthony Grafton's new book, Worlds Made by Words: Scholarship and Community in the Modern West. Can't wait to read this one myself, actually. - Ingrid Rowland reviews Bruce Redford's Dilettanti: The Antic and the Antique in Eighteenth-Century England for the NYRB. - Also in the NYRB, Hugh Eakin reviews two new books on the antiquities trade: James Cuno's Who Owns Antiquity? and a collection of essays (also edited by Cuno), Whose Culture? Iain Pears, of An Instance of the Fingerpost fame, returns to the form which brought him to prominence with Stone's Fall (forthcoming in May from Spiegel & Grau). Like Fingerpost this is a monster of a book (clocking in at 800 pages) but (also like Fingerpost) Pears puts every single page to good use. Stone's Fall is told in three sections, by three different narrators, in three entirely different chronologically-regressive decades and locations (London in 1909, Paris in 1890, Venice in 1867). It begins with the mysterious death of English financier John Stone, and concludes with him engaging in a certain youthful indiscretion which, nearly forty years later, serves to precipitate his sudden end. The story told here is a wonderfully complex one of the honeycomb-like intersections between European finance, military industry, and espionage, of the highest and lowest reaches of human society. As the book progresses we learn more and more about its cast of characters, whose actions and feelings we slowly come to understand as Pears reveals their past deeds (and misdeeds). With the first-person narrative style he has deployed so successfully in many of his books, Pears truly makes his reader a part of his tale, and his sense of timing is simply impeccable. Not to put too fine a point on it, this is a masterwork by one of the most ingenious and versatile writers of our time. It kept me up late at night, and was one of those books I almost couldn't help pulling out of my bag to read while walking home from work. It's a brilliant addition to the Pears canon, and I can say with confidence that it will almost certainly be one of my top books for 2009. I took a long walk this morning, out to Harvard Square and then down Mass Ave back into town, visiting the various bookshops along the route. - All Things Reconsidered: My Birding Adventures by Roger Tory Peterson (Houghton Mifflin, 2006). Harvard Bookstore. - Remember, Remember: A Cultural History of Guy Fawkes Day by James Sharpe (Harvard University Press, 2005). HUP Store. The family of longtime Simmons College library science professor Allen Smith has arranged for a $1 million gift to the college from his estate, we learned yesterday. This is the largest individual gift in GSLIS history, and will fund a visiting scholar program and an endowed scholarship fund for GSLIS students with an interest in oral history, reference, or humanities (some of Allen's passions). More from Simmons here [PDF]. Some of my memories and thoughts on Allen here. This one is Abrégé de l'Histoire Ancienne, en Particulier de l'Histoire Grecque, suivi d'un abrégé de la fable, a l'usage des Elèves de l'Ecole Militaire (A Paris: chez le veuve Nyon, Libraire, rue de Jardinet, An 10, ou MDCCCII ). It's one of a series of small texts produced for the use of the students of the École Militaire in Paris beginning in the 1770s. It's in French. I don't even read French. But it's a fascinating book. It's bound in pasteboards covered in what appears to be waste parchment (later stained or painted to produce the colored pattern). The old parchment, however, is almost entirely taken up with manuscript writing - which, from the way it overlaps the edges of the boards, was clearly there prior to the parchment's being attached to the cover boards. I can't make out much of the writing, which appears to be in French (if anybody wants to have a go, let me know and I'll get you some hi-res images), but I like it. That's interesting in and of itself, and there's still more. Several previous owners have made this book their own. Benjamin Duprat signed his named on the front pastedown, adding the date "14 fevrier 1812." 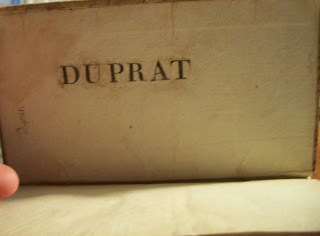 Duprat also signed the rear pastedown, and glued the letters of his last name there, ransom-note style. I still have some tracking down to do on Duprat, but it's possible that he's the same Benjamin Duprat who went on to become a well-known publisher and bookseller in Paris in the mid-19th century. If anyone has any information on that Duprat, I'd be delighted to receive it. Other owner's marks include an early inked list on the front pastedown of the fourteen rulers of Persia from Cyrus the Great (550-529 BC) to Alexander the Great (330-323 BC), and a later inscription on the recto of the front flyleaf: "Lucy D. Waterman / New York, July 1896." Sometimes it's not the content that matters. It's the story. And this little book has a great story to tell. Unless you've been sleeping for the past 36 hours or so you probably already know that Dan Brown's long-awaited Da Vinci Code sequel will be released by Doubleday on 15 September. The Lost Symbol will feature the further adventures of symbologist Robert Langdon, and word is that the entire plot occurs in just twelve hours. According to Allison Flood, "persistent rumours have suggested it will be set in Washington DC and will focus on freemasonry" (but publishing industry insider Ron Hogan suggests that perhaps Freemasonry is out and 2012-Maya-calendar-apocalypse "paranoia" is in). The publishers have ordered up a five-million-copy first printing of The Solomon Key, the largest initial run in Doubleday/Random House history. Within hours of the announcement, I had emails from Borders and Barnes & Noble telling me I could pre-order the book, for a 40% discount from the former and a 46% discount from the latter. Amazon hasn't yet emailed me, but they're also offering it at 46% off as of this evening. Funny thing is, they probably wouldn't even need to discount it like that. The book could be awful (and certainly has the potential to be) but people will still buy it. Heck, I'll still buy it. Columbia announced the 2009 Pulitzer winners this afternoon. The full list is here. - In the Globe today, a non-story that the BPL may deaccession some out-of-scope items from its collections. Turns out non-functioning pianos and glass postcard printing plates aren't necessarily integral to the mission of the Boston Public Library. Institutions part with objects that don't fit in with their collecting policies all the time - this should not come as a surprise to anyone. What's important is that there be policies in place to govern such actions: transparent procedures for deaccessioning, decisions on how the funds can be used, &c.
- For the New Yorker, Jill Lepore writes on Poe and his horror stories. Over at the magazine's blog, she offers up a Poe cryptogram for readers to solve (answer tomorrow). - Paul Collins has a piece in the New Scientist about the Victorian fad for gaming by telegraph (chess, bowling, even billiards!). - And the one I missed: In Thursday's NYTimes, Mary Beard has an essay on the book trade in ancient Rome. Book Review: "The Book of God and Physics"
In the tradition of bestselling Spanish literary mysteries like The Club Dumas and The Shadow of the Wind comes Enrique Joven's The Book of God and Physics (forthcoming from William Morrow, first published as El Castillo de las Estrellas in 2007). Joven's work concerns the quest to solve the mysteries of the Voynich Manuscript, the strange and mostly indecipherable work now housed at Yale's Beinecke Library (lots of info at the Wikipedia page). The protagonist, Hector, a Jesuit teacher of high school physics and an amateur Voynich scholar, finds himself drawn into a bit of a mystery when he starts to find clues about the manuscript right in his own institution (and when he realizes that the other 'amateurs' he's been corresponding with about the manuscript aren't entirely what they seem). As he recounts the strange history of the Voynich, Joven lapses a bit too much into exposition (always the danger of this type of book), and I found his use of a precocious high-schooler armed with reams of Wikipedia printouts as the main source of recited background information slightly problematic. Much of the book also amounts to little more than an extended and strongly-worded critique of Joshua and Anne-Lee Gilder's 2004 book Heavenly Intrigue (which postulates that Kepler murdered Tycho Brahe) and potshots at anti-evolutionist belief (entirely justified, to be fair, but perhaps a bit out of place here). What isn't clear through almost the entire book is just why those who seek to block the 'breaking' of the manuscript are so worried about it (and/or how do they know before its secrets are revealed what it's going to say?). But, given the ending, I guess that's something we'll have to wait for the sequel to discover. Book Review: "McSweeney's, Vol. 14"
McSweeney's Vol. 14 (2004) is a collection of seventeen pieces of short fiction, two "Convergences" essays by Lawrence Weschler, and journalistic remarks on giant Chinese gerbils. Bearman's gerbil exposé was fun, and reading through the fiction was good for me too, especially since most of it isn't the kind of work I'd normally be drawn to. Some I liked, some not so much. All were well written and worth reading, though. The musings of a Roman foot soldier stationed on Hadrian's Wall, the internal dilemmas of a female matador, and T.C. Boyle's interesting take on Madam Knight's 1702 trip to New York were good reading. I was creeped out by Ryan Boudinot's dystopian "children have to kill their parents," and affected by Silvia DiPierdomenico's detail-heavy story of a cancer diagnosis. The murderous space pigs were also slightly creepy. A good, eminently browseable collection of McSweeney's-type fiction. - First of all, if you're not one of the 13-million-plus 30-million-plus who've already seen it, do watch Susan Boyle's performance on last Saturday's "Britain's Got Talent." It's simply amazing. And she's even singing a song from a musical based on a book, so it fits right in here. - In the Boston Globe this week, a compilation gallery of most of the used bookshops in town. Visit them all, and often! - Pulitzer prizes will be awarded on Monday. As Carolyn Kellogg points out, PPrize.com has posted a list of what they think are the likely winners for the fiction prize. - A rare Renaissance-era textbook stolen from the history museum in Kotel, Bulgaria has been found, and a local antiques dealer has been arrested in relation to the theft. - Lots of press about it this week, but it's a fun story: Washington & Lee College received a long overdue book back recently; it'd been taken by a Union soldier in 1864. The volume is the first of four in Napier's History of the War in the Peninsula and in the South of France From the Year 1807 to the Year 1814. It was returned by a friend of descendants of the soldier. More at AntieQuarian. - Another volley in the Shakespeare Portrait Battle: the Folger's Erin Blake has a letter in the TLS in response to the last. And in other Shakespeare news, Justice John Paul Stevens said this week he believes that Edward de Vere, the Earl of Oxford, may be the true author of the plays typically attributed to Shakespeare. The WSJ asked other justices to respond: Scalia concurred with Stevens (! ), while Kennedy and Breyer opted in favor of the traditional attribution. Retired justice Sandra Day O'Connor said "It might well have been someone other than our Stratford man." - The Commonwealth Museum at the MA State Archives building on Columbia Point in Boston reopens tomorrow, the Globe reported on Friday. The exhibit will be "Our Common Wealth: the Massachusetts Experiment in Democracy." - Tim & Co. unveiled a flashy new catalog layout at LT. I like it! - The Gates Foundation is giving $5 million to OCLC to "develop a public information campaign to boost library support." Why not just give money to the libraries? - On 22 April, Dunbar Sloane Auction House in Wellington, NZ will sell the collection of Edward C. Simpson (PDF Catalog), which is being called "one of the most important collections ever to be offered on the Australasian market." - J.L. Bell points out a new searchable database of the London Gazette. He's right, the search is a bit clunky, and I couldn't find a way to browse (boo) but for specific things it should be very useful. - In the Boston Globe, Katherine Powers reviews Robert Sullivan's The Thoreau You Don't Know. And David Gessner reviews the same book for the NYTimes. - In the Times, James McConnachie reviews RA Scotti's The Lost Mona Lisa and John Brewer's The American Leonardo. - Journey to Mauritius by Bernardin De Saint-Pierre (Interlink Books, 2002). Raven. - Witchfinders: A Seventeenth-Century English Tragedy by Malcolm Gaskill (Harvard University Press, 2005). HUP. - Julian P. Boyd: A Bibliographical Record Compiled and Offered by his Friends on the Occasion his Tenth Anniversary as Librarian of Princeton University by P. J. Conkwright (Princeton, s.n., 1950). Carlson & Turner (Portland, ME). - A Dictionary of the Print Trade in Ireland, 1550-1775 by Robert L. Munter (Fordham University Press, 1988). Carlson & Turner. - The Diary of Humfrey Wanley 1715-1726 (2v. ); edited by C.E. and R.C. Wright (London: Bibliographical Society, 1966). Carlson & Turner. - Abrégé de l'Histoire Ancienne, en Particulier de l'Histoire Grecque, suivi d'un abrégé de la fable, a l'usage des Elèves de l'Ecole Militaire (A Paris: chez le vetore Nyon, Libraire, rue de Jardinet, 1802). Carlson & Turner. Stay tuned. I've more to say about this one! The Portland trip was great fun - got to hang out with LibraryThing's Tim Spalding and talk all things book (we even recorded a podcast about the Legacy Libraries which he may subject you to, even though I kept telling him I have a voice made for the printed page). He gave me the full Portland tour, and we got to visit a number of the used and indie bookshops in town. One of these - Books Etc. - is sadly closing next week, and another - Carlson & Turner - had one of the best used books on books sections I've come across in a long time. My talk at NEHA went alright, although the computer was possessed by demons (literally, I think - someone else was controlling the system from outside the room, it was quite creepy ... I was rather glad to find out later that it had happened to other panels too). And they schedule so many panels at once that there's not much opportunity to draw an audience, which was a bit of a shame. But my paper seemed well received and it was nice to see old friends and make some new acquaintances. Also, I must recommend Amtrak's Downeaster, which I took up and back from Boston. Friendly staff, smooth ride, pleasant scenery - all that together makes for a nice easy trip. Alright, off to add the new books; will post about them shortly. There's a wonderful digital display on the NYTimes website today of an anonymous diary made by a New Yorker the day following Lincoln's assassination. The diarist walked the streets and drew the impromptu displays that shopkeepers and others had put up in their storefronts, creating a snapshot of mourning. The diary is now in the Charles Woodberry McClellan collection of Lincolniana at the John Hay Library, Brown University. Ted Widmer, the head of the John Carter Brown Library, has provided very useful annotations to the pages displayed. A spectacular document, and thanks to all those reponsible for sharing it widely. What a treasure. It's been a busy week. Lots of meetings and other things, but also because I've been trying really hard to finish up a project which I'll be speaking about on Saturday at the New England Historical Association meeting in Portland, ME. That's George Wythe's library, which is now just about all into LibraryThing (here). * The reason this is interesting is because not very much at all was known about Wythe's library until fairly recently (last November or so), when a colleague from Monticello and I identified a list of books in the MHS' Coolidge Collection of Thomas Jefferson Manuscripts as an inventory of Wythe's library, which was bequeathed to Jefferson. The list is now online digitally and in transcribed form, with the LT-catalog as an enhancement (complete title information, edition information where we know it, what Jefferson did with the books he received, where the remaining volumes went, &c.). Hopefully you'll be seeing more about this in other venues soon, but for now that's what I can tell you! And if you're in Portland on Saturday morning, come by and hear the talk (info here, PDF). *I still have a few titles and other cool data to add, including some notes on where Wythe originally got the books, &c.
Raymond Scott was back in court today in Consett, England, where he showed up dressed as Che Guevara, carrying a handgun and a rifle (plus his instant noodle soup). Three men and women also in guerrilla outfits got out of the limo behind Scott; one of them was holding a sign reading "Blockade kills Cuban children." Scott was forced to turn over his weapons at the court entrance, and in a brief hearing was told that his case is being turned over to Durham Crown Court for trial. He'll appear there on 22 May. Can this guy possibly get any stranger? Today I had the chance to visit the Internet Archive's scanning station at the Boston Public Library, where they're scanning the John Adams Library (among a great number of other things, including books scanned-on-demand!). It's quite a cool setup, a big dark room with ten separate scanning stations (most of which were running while I was there). They run two shifts a day, and while I was there a wide range of items were being digitized (including one of the Adams books, a volume of Don Quixote). I can't remember if I've written about it or not, but I'm absolutely thrilled with the quality of the Internet Archive's scans, and much prefer them to Google's. I think it's great that they're making inroads in the Boston area, and I hope they'll keep up the great work. Oxford University Press is offering free access to Oxford Reference Online this week, and they're kicking it off with a scavenger hunt of library trivia. Great questions, too - have fun! - In the Boston Herald, a really intriguing glimpse into the infamous Gardner Museum Heist, examining the strange actions of one of the two young guards on duty that night. - Biographer T. J. Stiles wrote this week and pointed out some interesting discoveries he made when researching his new book (The First Tycoon: The Epic Life of Cornelius Vanderbilt). Among them were some very questionable conclusions drawn by a previous Vanderbilt biographer (Edward Renehan, who we know here as a document thief). - In the WSJ, Peter Manseau has an essay on the Shroud of Turin and other holy relics, following the release this week of a report from Rome which reveals a document explaining the Shroud's whereabouts from 1204-1353 (it was being kept safe by the Knights Templar). A new documentary on the Shroud is set to air on the Discovery Channel in the UK today, and the Shroud itself is set for a new public exhibition next year. 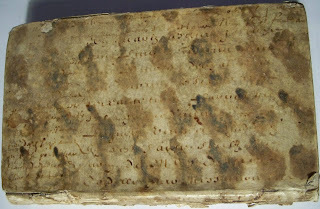 While studying accounts of the Templar trials in the Vatican Secret Archives, Barbara Frale found the testimony of Arnaut Sabbatier, who said that as part of his initiation into the Templars, he was taken to a secret location and shown "a long linen cloth on which was impressed the figure of a man." Frale is the same researcher who in 2003 discovered the Chinon Manuscript, the record of the Templar Trials published in 2007 as Processos contra Templarios. Frale's find casts into (further) doubt the 1988 carbon-dating tests which indicated the Shroud was created in between 1260-1390. - The new visitor center at Monticello officially opens on 15 April, so there are a few profiles and review: Edward Rothstein for the NYT, Michael Kranish for the Globe. Rothstein adds Jefferson's 'vacation home' of Poplar Forest to his visit. - Caleb Crain, one of the most thoughtful writers on the Google Book Settlement out there, posted the letter of objection he sent to the court charged with overseeing the settlement this week. - From the Oxford DNB, Richard Steele's biography, made available this week to mark the 300th anniversary of the release of the first issue of The Tatler (12 April 1709). - Much hoopla this week about the impending launch of the World Digital Library (21 April). - In the TLS, Biancamaria Fontana reviews Caroline Moorhead's Dancing to the Precipice: Lucie de la Tour du Pin and the French Revolution. - McSweeneys 29 is reviewed by Nicholas Blincoe in the Independent. - In the NYT, Miranda Seymour reviews Andrea Wulf's The Brother Gardeners: Botany, Empire, and the Birth of an Obsession. - Another joint review of Drood and The Last Dickens, this one by Jake Kerridge in the Telegraph. - Studies in Eighteenth-Century Culture (Vol. 38); edited by Linda Zionkowski and Downing A. Thomas (Johns Hopkins University Press, 2009). Publisher. - The Better of McSweeney's, Volume 1 (McSweeney's, 2005). Publisher. - The Book of God and Physics: A Novel of the Voynich Mystery by Enrique Joven (William Morrow, 2009). Publisher. At Sotheby's Paris sale of the collection of Christope d'Astier, the high spot was a first edition of Vercour's Le silence de la mer (1942), which made 17,500 Euros. A Jacques Vaché letter made 15,625 Euros, and three items each made 15,000 Euros (first editions of Proust, Joseph Kessel's Le Lion and Charles de Gaulle's Mémoires de guerre, signed). Across the Channel to Christie's London for the Travel, Science and Natural History sale. Not surprisingly the Leeuwonhoek silver microscope won the day, fetching a grand £313,250. The top-selling book was James Baillie Fraser's Views in the Himala Mountains (c. 1820), which made £30,000. John Webber's Views in the South Seas from drawings taken on Board the Resolution, 1776 to 1780 (1788-92), sold for £28,750. Also, Sotheby's has a fascinating video up of the Valmadonna Trust Library, currently being offered for private sale. From the Globe today: If Mayor Menino's proposed budget is accepted by the Boston City Council, not only will the city lose its mounted police and park ranger units, but 26 positions would be cut from the central Copley Square branch of the Boston Public Library (17 assistants, 5 managers and 4 librarians). The city would also lay off 123 employees of the police department and 364 school workers, including 212 teachers/and paraprofessional aides. Officials say they hope that the arrival of federal stimulus money and further union concessions might forestall some of the layoffs, including those of 67 police officers. Final passage of a Boston budget is expected by 1 July. It's a good thing we got Pack back, we all needed a cheerful story these days. All this doom and gloom is getting hard to take. Even before my post this morning, the missing duckling statue had been found, according to the Boston police department. Pack was discovered in Beacon Hill, at Brimmer and Mt. Vernon Streets, around 3 a.m. today. He's safe and sound for now at a police station until he can be returned to his family. Here's the story about his recovery. One of Mrs. Mallard's brood has gone missing. Pack, the second-to-last of the ducklings in the famous Boston Public Garden statue based on Robert McCloskey's classic book Make Way for Ducklings, was abducted overnight on Sunday, leaving only a gap and two little bronze webbed feet. The statue, by Nancy Schon, has been in the Public Garden since 1987. This is the fifth duckling theft. Boston authorities are taking Pack's disappearance seriously: Mayor Menino said yesterday "This act is not a prank; it is a crime. We would strongly encourage anyone with information to please come forward to assist with Pack's safe return." The culprit, if caught, could face prison time and a hefty fine for the theft of public art. I think I speak for all of us when I say to whoever committed this dirty deed, "Bring Pack back, you quack!" If you're a Common-place fiend like me you've already gotten your copy via email, but the new issue is out today. I haven't gotten a chance to read the articles yet, but I'm very much looking forward to them. It's a special issue this month, "Who Reads an Early American Book?" (edited by Joanna Brooks and Bryan Waterman). I'm sure I'll have more to say on the various articles as I dig in, but until then, enjoy! Book Review: "Audubon: Early Drawings"
Every artist has to start somewhere, and Harvard University Press' sumptuous new collection Audubon: Early Drawings provides a fascinating look at some of the John James Audubon drawings now in the collections of Harvard's Houghton library. These show Audubon in the learning process, as he was still developing his style of portraying birds in lifelike poses rather than in the stiff, portrait-style positions favored by his predecessors. Houghton Curator of Modern Books and Manuscripts Leslie Morris provides a foreword to the volume, introducing the collection and how the drawings came to be at Harvard. Audubon biographer Richard Rhodes contributes an essay on the artistic and stylistic influences of Audubon, and there is an essay by Scott V. Edwards, Curator of Ornithology and Harvard's Museum of Comparative Zoology, on the scientific sources used by Audubon (including Buffon, Wilson, Pennant, Willughby and Catesby). Edwards also captions each image with a short comment on the species portrayed. Plates 1-68 cover American species, with Plates 69-111 showing European species and the final four plates depicting exotic birds (drawn from captives or specimens) and two mammal species. The reproduction quality is excellent, with each plate given a full page in the large oblong volume. A necessary addition to the shelves of any Audubon fan. - At Bookman's Folly, a nice writeup of national book histories published and in-process. - Paul Collins has the headline of the week: a fascinating story about a typically French sort of protest. - Duke announced this week that some portion of its library budget will be cut for the coming year. - Rick Ring's got a great Isaiah Thomas letter to fellow printer John Carter. - Another exchange in the TLS Letters section, this time over Pat Rogers' essay on Jeremy Thacker published last November (mentioned here). on 18 March, Jonathan Betts and Andrew King respond to Rogers' original piece, and this week Rogers answers their critique. - The University of Georgia announced plans for a massive new special collections library. - Publisher-turned-novelist Michael Cox (author of The Meaning of Night) died this week at age 60 after a long battle with a rare form of cancer. Coverage: Guardian, Times. - In the NYTimes, Claire Tomalin reviews John Guy's A Daughter's Love: Thomas More and his Dearest Meg. - Virginia Smith reviews The Last Dickens for the Boston Globe. Book Review: "The Ascent of George Washington"
When I started John Ferling's The Ascent of George Washington: The Hidden Political Genius of an American Icon (forthcoming, Bloomsbury) I thought how on earth can anyone have anything new to say about George Washington as politician? But I'm happy to say that the book is worth the time, since Ferling manages to package his subject in a different way than most of the conventional Washington biographies do. Ferling's major argument here is that Washington was a tremendously skilled political actor, who managed throughout his career to maneuver himself into optimal circumstances (without, for the most part, getting his hands dirty in the process). Ferling calls Washington a "canny political infighter - a master of persuasion, manipulation, and deniability," and uses the book to provide numerous examples of how Washington exercised those skills to his advantage. Among the situations Ferling examines closely are Washington's experiences during the French & Indian War; his handling of the Conway Cabal and of the Newburgh Conspiracy; and the partisan pressures of the 1790s. Throughout his career, Ferling argues, Washington looked to improve his own reputation and standing (often at the expenses of others) in quiet but powerful ways, deploying surrogates, scapegoating his rivals, and deftly keeping himself on top of the political, military and economic heap by any means necessary. But the point isn't to diminish Washington's reputation, Ferling writes, it's to recognize that such actions were exactly what was necessary to hold the United States together during the dark days of the Revolution and keep the nation going following ratification of the Constitution. Well-written and researched, with excellent endnotes. A fine book. Yesterday's trip went really well, a great crowd at the Athenaeum even with the deluge. It was nice to see old friends and meet some great new folks, and the audience was really engaged with the talk and asked excellent questions. If you haven't been to visit, do go! - The Shakespeare Wars: Clashing Scholars, Public Fiascoes, Palace Coups by Ron Rosenbaum (Random House, 2006). Harvard Bookstore. - Audubon: Life and Art in the American Wilderness by Shirley Streshinsky (University of Georgia Press, 1998). Raven. - The Sun and the Moon: The Remarkable True Account of Hoaxers, Showmen, Dueling Journalists, and Lunar Man-Bats in Nineteenth-Century New York by Matthew Goodman (Basic Books, 2008). Raven. - A Paradise of Reason: William Bentley and Enlightenment Christianity in the Early Republic by J. Rixey Ruffin (Oxford University Press, 2007). Raven. - Journey to the Ants: A Story of Scientific Exploration by Bert Hölldobler and E.O. Wilson (Harvard University Press, 1998). HUP Store. - Samuel Johnson: A Biography by Peter Martin (Harvard University Press, 2008). HUP Store. - The Key of Liberty: The Life and Democratic Writings of William Manning; edited by Michael Merrill and Sean Wilentz (Harvard University Press, 1993). HUP Store. - The Works of Anne Bradstreet; edited by Jeanne Hensley (Harvard University Press, 2005). HUP Store. - The City of Dreaming Books by Walter Moers (Overlook, 2007). Brookline Booksmith. I'm heading down to the Providence Athenaeum to speak on the Libraries of Early America Project tonight. We'll talk project history, goals, and all things LibraryThing (tags, works, &c.), and look at some of the completed and ongoing libraries. If I can figure out how a handy way to post slides and notes I'll do so. Joshua McCarty, 31, has been sentenced to three years and ten months in prison, plus three years of probation, for the theft of two rare law books from the Rutherford B. Hayes Presidential Center (first noted here back in September). His partner in crime, 21-year old Zachary Scranton, will be sentenced on 11 May. Another associate originally arrested in the case, 19-year old Angela Bays, was not charged. Under the original charges filed, McCarty faced up to ten years in jail. The two books, which have been in FBI custody since their recovery last fall, were returned to the Hayes Center on Wednesday. Fremont police detective Sean O'Connell called the case "definitely the most challenging investigation in my career," saying that investigators had almost nothing but vague descriptions (of the books and suspects)." Blessedly, the Hayes Center now seems better equipped to make sure a theft like this doesn't happen again: "All library visitors must present a photo ID and complete a full visitor registry will their full name, address and phone number. Visitors have to put coats, briefcases, backpacks and other items on the coat rack or in lockers before going to the library reading room." A Spot of Good News! - After suggesting last week that they would be cutting $900,000 in journal subscriptions, Virginia Tech announced that administrators have decided to increase library funding by $300,00 for next year, rather than facing cuts. The funds will come from some of the $17 million in federal stimulus money destined for V-Tech. - In the Boston Globe today, news that amid tough times, Brookline Booksmith and other indie bookshops are holding their own and thriving. Three cheers! After Katherine Duncan-Jones' effective volley in the Shakespeare Portrait Wars, Mark Broch, Paul Edmondson and Stanley Wells fired back with a letter in the TLS this week, although some of the claims made within seem, eh, thin, if not outright laughable. They write that the Cobbe portrait can't possibly be Overbury, (even though it bears an uncanny resemblance to known portraits of him). "Perceived resemblance unsupported by documentary evidence is a naive (though natural) basis for identification," ... but isn't that exactly what they've done in calling the Cobbe painting Shakespeare? And in Slate, Ron Rosenbaum starts off an essay by examining the portrait controversy, but then spins into a discussion of whether Shakespeare's attractiveness (or lack thereof) matters at all. As part of the John Adams Unbound traveling exhibition (currently at the Minerva Public Library in Minerva, OH) the Boston Public Library has launched Where in the World is John Adams? to highlight the world travels of their new JA bookmark. Among the places he's visited so far: the Mall of America; Mickies Dairy Bar in Madison, WI; Red Sox spring training in FL; and Jefferson's library at the Library of Congress. You can also follow the exploits of JA on Facebook or Twitter. Or check out John's April Fool's Day visit to the MHS. And remember, JA's library is browseable! Find Suggests a Real "Gulliver"
Jonathan Swift's Travels into Several Remote Nations of the World, first published in 1726 and better known to modern readers as Gulliver's Travels, has since its publication been assumed to be a fictional piece, a satire on contemporary human culture and a tongue-in-cheek response to the popular travel narrative genre. But a recent discovery in an English country house is leading many scholars to question their longstanding views on the book and its origins. Was there a real Lemuel Gulliver? Late last week, contractors performing renovations on a centuries-old house near Rotherhithe, England broke through a brick wall to find a small closet which contained a large, locked wooden sea chest, along with several shelves of books and other assorted detritus. Stenciled on the chest was the name "Samuel Tolliver," known to be the original owner of the house, the oldest parts of which were built c. 1725. The contractors reported their find to Peter Tolliver, the current resident of the house and a direct descendant of Samuel. "I had to find out what was inside," Tolliver said. A local locksmith successfully removed the lock, and Tolliver, his wife and two children gathered for the opening. "I figured sure it would be nothing but old clothes or junk," Tolliver said. "Finding what we did, well, that was the shock of a lifetime." The chest's contents have sent shock waves through the community of Swift scholars, as they seems to reveal a new, very real source for Gulliver's Travels. "The first thing we noticed was the gold ring," Peter Tolliver told a group of reporters who flocked to an impromptu news conference outside his house on Monday afternoon. "It's huge!" Of all the items contained in the chest, the ring, elegantly decorated and eight inches in diameter, is by far the most striking: displayed for reporters on Monday with the rest of the items found in the chest, it shone brilliantly in the spring sunshine. The ring matches the description of that which Swift's Gulliver describes at the end of his voyage to Brobdingnag. He writes that the queen of that nation "made me a Present of [the ring] in a most obliging manner, taking it from her little Finger, and throwing it over my Head like a Collar." The ring was only the beginning, however. Also in the chest were what appear to be other materials described by Swift as Gulliver's souvenirs from his travels. Additional items from Brobdingnag include the remnants of what may be the two combs Gulliver fashioned from the beard-clippings of the king (the hairs themselves have degraded); a number of large pins and needles each measuring more than a foot in length, and a cup set in silver (possibly that made of the "Corn ... from a Maid of Honour's toe"). Another item found in the chest may be the large wasp-sting described by Gulliver. In a small wooden box, originally found in a corner of the chest, were artifacts which appear to confirm another of Gulliver's adventures, his unsought voyage to Lilliput and its neighbor Blefescu. Within the box the Tollivers found a small, dollhouse-sized oil portrait of a man in royal garb (Gulliver reported having received just such a painting from the king of Blefescu upon his departure from that country), plus a leather bag full of miniscule gold coins and several articles of very small clothing. A badly-prepared biological specimen was also found in the box; it may have been one of the sheep or cows Gulliver brought back alive from his travels and later had taxidermied, but it is in very poor condition after centuries of storage. Assorted letters and documents attesting to the various pieces found in the chest were also present, the Tollivers told the assembled reporters, but the family is currently withholding those from public view until the collection can be appraised. Experts from Sotheby's and Christie's are said to be vying for the opportunity to authenticate and perhaps eventually sell the collection. Peter Tolliver did reveal a letter written by Samuel Tolliver in 1726 which he says was folded and placed atop the items in the box. That letter indicates that Tolliver felt betrayed by Swift's publication of what he called "my own true life," and that he planned to hide the materials so that no more "prying uses" could be made of them by "nasty scriblers." Peter Tolliver said that not much is known about his ancestor's maritime travels, but that family legend had it that he was known as an "unlucky sailor, more often wrecked than on course, and daft as can be at the end of his life." Local parish records note Samuel Tolliver's death in 1728, just two years after the original publication of Swift's book. When or how Samuel Tolliver met Jonathan Swift has not yet been determined, but Swift's correspondence is now being carefully combed for clues. The Rotherhithe cache has had a ripple effect: librarians at London's Gresham College have provided an exemplar from a pair of wasp-stings in their possession to make a comparison to that found in the Tolliver chest (Swift has his Gulliver donate three stings to Gresham and retain one for himself), and a small Devonshire church has offered to provide its so-called "Gulliver tooth" for testing as well. "We've always believed it was true," vicar Alex Dodge said. "We've had the story all along that this was the giant's tooth given by Gulliver to the captain who rescued him from that awful land of behemoths, but until now everybody's thought we were barking mad." The tooth, along with several other of the biological specimens, have been sent to a national forensics lab for examination. While many Swift scholars are exuberant about the findings, some aren't convinced. Dr. Everard Wicks, Professor of English at Twickenham College, says the find is "simply impossible. Swift wouldn't have stolen a story, it wasn't his nature. Curll, sure, but not Swift," he sniffed, referring to the infamously unscrupulous printer/published Edmund Curll, a Swift antagonist. The Tolliver chest, Wicks maintains, "must be outright fakery." But, he admitted upon seeing pictures of the artifacts, "if they're fakes, they are good ones." Asked to respond to Wicks, Peter Tolliver chuckled. "I didn't even know that room was there," he said, "and I've lived in this house my whole life. If all this is fake, I'd sure like to know how and why they did it." He said he bears Jonathan Swift no ill will, but hopes that this new find will revitalize interest in his ancestor's travels. "Gulliver's Travels is a great book," he told reporters. "Go home and read it. You'll learn something."